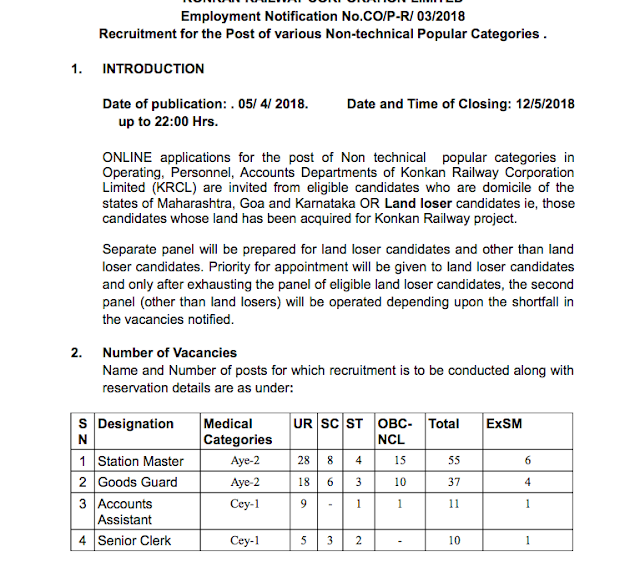 Konkan Railway RRB NTPC 2018 ने वेकैंसी निकाला है, और Good news for domicile of the states of Maharashtra, Goa and Karnataka OR Land loser candidates ie, those candidates whose land has been acquired for Konkan Railway project. Date of advertisement: .05/ 04/ 2018. Date of Start of Online Application: 06/ 04/ 2018. Date and Time of Closing: 12/ 05 /2018 up to 22:00 Hrs. Domicile of Maharashtra or Goa or Karnataka. Other than this, candidates those lands has been acquired by KRCL can also apply.